Home > Perion Network Ltd.
Found 15 file extension associations related to IncrediMail and 15 file formats developed specifically for use with IncrediMail. IncrediMail is a free, fun, powerful and user-friendly e-mail program that lets you add 1000s of e-mail backgrounds, Emoticons, Ecards, Sounds, Animations, and 3D effects to your e-mails. You also get fun animated characters to notify you of incoming e-mail. 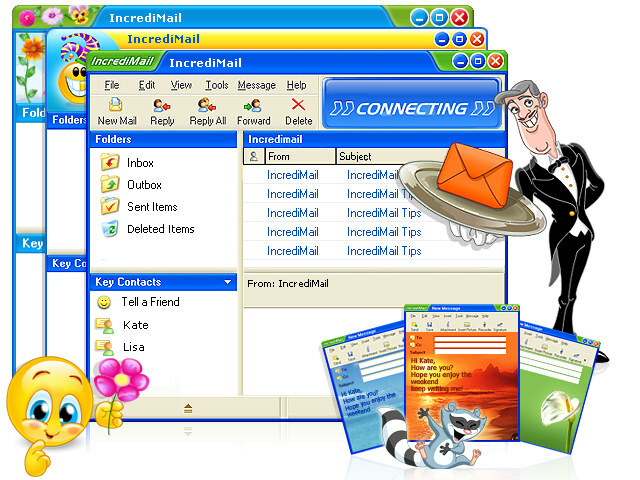 IncrediMail is compatible with leading email services including Hotmail, Gmail, Yahoo, and AOL, and supports POP mail protocols as well as HTML mail formatting. Importing your active e-mail accounts and messages with IncrediMail is quick and simple. The program includes advanced message filtering, automatic spellchecker, and font style preferences. If you need more information please contact the developers of IncrediMail (Perion Network Ltd.), or check out their product website.